As the name implies, the focus on this type of meditation is on building concentration. In fact, it is the most important of all types of meditation. If you want to reap the fruits of meditation, you have to train your mind to focus and concentrate on some object or nothingness; in other words, you have to eliminate all distractions. Only then, your mind becomes calm and ultimately it can awaken beyond the sense of self. There are different types of meditation techniques including Mantra or Om meditation, Shine meditation or Samadhi, Transcendental meditation, and Chakra meditation. Besides, there are different types of Buddhist meditation as well. Also known as analytical meditation, it refers to well disciplined thinking. If you wish to effectively practice reflective meditation, you have to choose a theme, question or topic and focus your reflection or analysis upon it. In the beginning, your thoughts are sure to wander to other unrelated topics but you have to train your mind to return to the chosen topic. Only if you learn concentration meditation, you can do reflective meditation with ease. What is the role assigned to me? 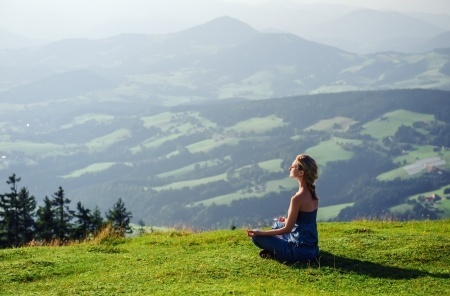 Mindfulness meditation is easily one of the greatest and alternative meditation techniques. It stresses on cultivating an extremely receptive mindful attention toward objects or actions within your sphere. It is also an important meditation type that enables you to learn to be ‘mindful’ or pay attention. This meditation technique offers pain relief as well as helps those dealing with depression and anxiety. Mindfulness Meditation includes several types of yoga meditation, deep breathing meditation, visualization meditation, body scan meditation, Vipassana meditation, mindful breathing, walking meditation, sitting meditation, and so on. Heart centered meditation focuses on releasing all the sadness and fears of the mind and fill it with kindness, love and compassion. Practicing this meditation for quite some time heals not only your heart but that of others as well. This technique helps open the heart chakra and gets rid of all negative energy that exists within. Using this meditation technique, you can even connect your heart to the heart of a compassionate person or teacher. Creative meditation is a different type of meditation. It helps you to willfully cultivate and strengthen various qualities of your mind. The main focus is on strengthening the core values and qualities like joy, compassion, appreciation, empathy, patience, gratitude, love, fearlessness, tenderness and so on. Creative meditation invites you to enthusiastically nurture these characteristics by thinking, speaking, and acting. By learning how to do meditation and practicing meditation exercises regularly, you can overcome a lot of stress in life and lead a happy life. We offer a variation of 3 audio guided meditation sets. These could get you started with meditation and are easy to follow with clear guidance. If you’d like to start meditating these guided meditations are a good way to start. Just follow the link below to take a look at them. Take a look at our Guided Meditations!